We expected answers last week at the season opener at Hangtown, and we got some. But the opener also has a way of creating more questions than it answers. After all, it’s the first race and guys are still working on dialing things in. 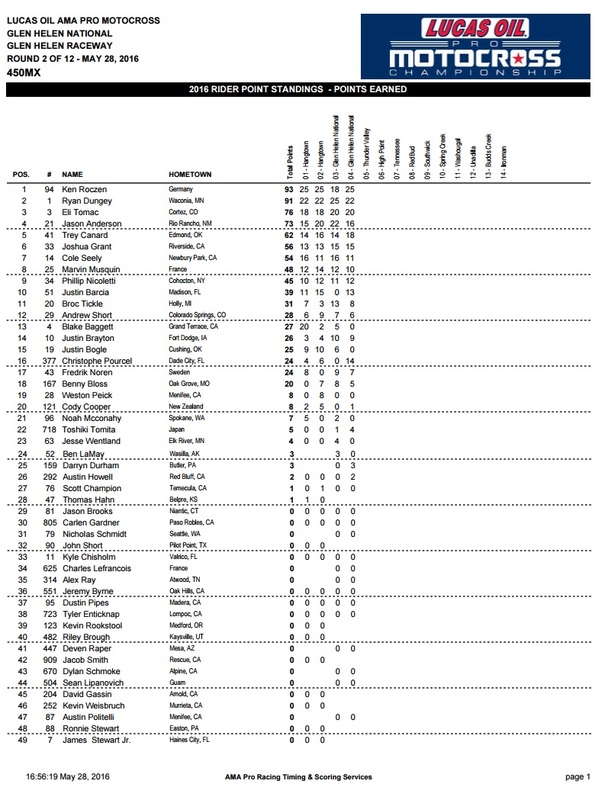 Surely Ken Roczen wouldn’t be able to mop the floor with Ryan Dungey for the second straight weekend in a row, and no way Jeremy Martin lets Joey Savatgy be perfect again, right? Well, Roczen didn’t beat Dungey today and no, Joey Savatgy wasn’t perfect. But it’s not that simple. Let’s dive into Saturday Night Live to find out more. Let’s go ahead and address the elephant in the room. On paper Dungey won the 2016 FMF Glen Helen National, but anyone who saw the race knows it was a byproduct of Roczen’s misfortune late in moto one. But what exactly happened? The air forks on Roczen's Suzuki lost pressure after a seven dollar fitting the team installed failed. When it did, Roczen could no longer charge and was unable to jump almost anything and was reduced to scrubbing his way around the track. This allowed Dungey to catch back up, and with about a lap left Jason Anderson and Eli Tomac also nipped Roczen, dropping him to fourth. Heartbreak for Roczen, especially if he ends up losing the title by just a few points, but these things happen in racing. Remember when Dungey’s fuel boiled at Freestone a few years ago? There’s a lot of talk about Eli Tomac and his poor starts, but even a pair of holeshots may not have delivered a win today. In the first moto Tomac just didn’t seem to have the pace of the leaders, and he even got caught and passed by Jason Anderson. In the second moto he was ripping, but nobody had anything for Roczen, whose average lap time was over a second faster than Tomac’s. Cole Seely repeated his streak of having a good first moto but wasn’t able to follow up in the second, going 5-10 for seventh overall. That’s due in part to a small crash in the second moto. Afterward he remarked how tough it is trying to test for the Nationals since none of the tracks they test on ever have the same conditions as the Nationals. He also said he’s putting extra effort in to get better at motocross. Not a great day for the Autotrader/Monster Energy/Toyota/JGR Yamaha crew. Justin Barcia suffered a mechanical problem in the first moto that resulted in a DNF, and Weston Peick crashed hard in the same moto and tore up his bike. He knocked himself around too, so much so he had to sit the second moto out. The team told us his bike was so mangled they may not have had time to even get it completely ready to go for the second moto anyway. Speaking of teams that had a rough outing, Yoshimura Suzuki’s day was just about done before it even started. 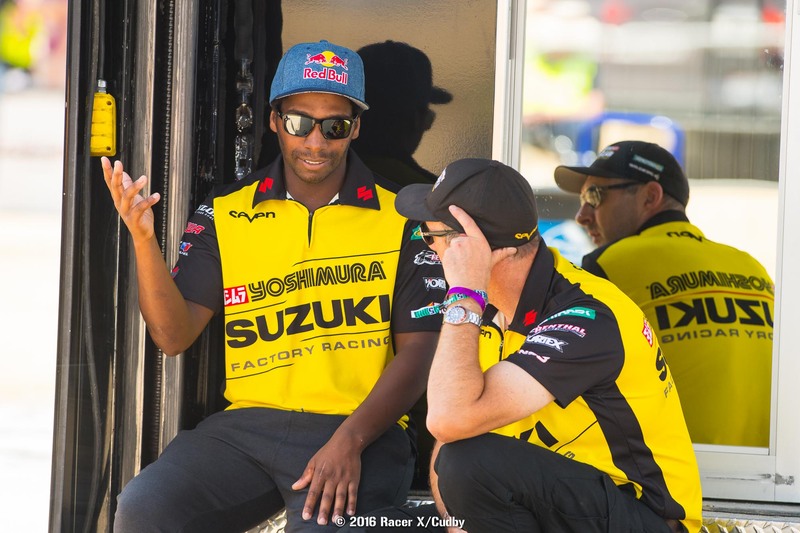 Both James Stewart and Blake Baggett were dealing with injuries suffered at Hangtown but decided they would try practice to see how they felt. Stewart’s hurt shoulder didn’t feel good enough to race, but surprisingly Baggett’s broken collarbone, which he had surgery on earlier in the week, held up. Baggett raced the first moto, finishing sixteenth, but sat the next one out. Here’s hoping they can both get healthy soon. Alex Martin had to be bummed after the first moto after leading almost the entire race before succumbing to a hard-charging Cooper Webb at the end. But, good things were in store for Martin in the second moto. Martin’s brother Jeremy, you know, the reigning champ, ran away with the moto win, but Alex worked through a few guys, finally getting around Jessy Nelson for second late in the race, which put him in position to win the overall. Webb was charging forward though, and for a few moments it looked like he could catch Nelson for third, which would put the overall in Webb’s hands. Nelson held on though, which delivered Alex Martin his first ever overall National win, as well as the points lead. 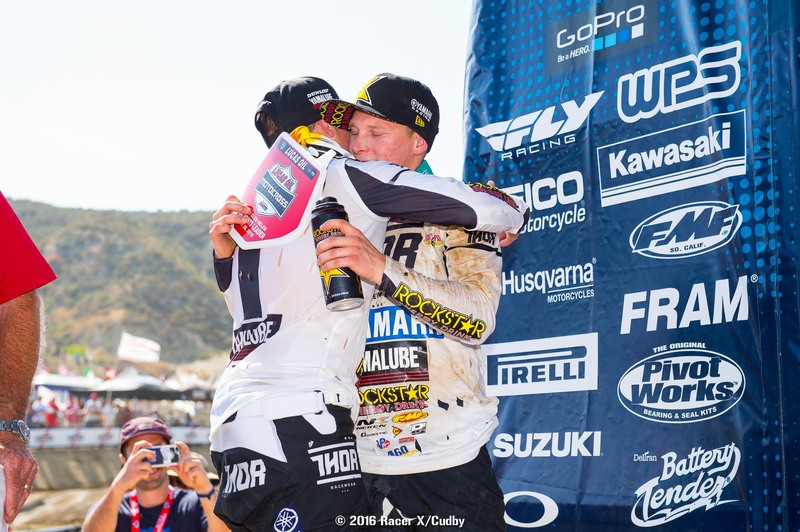 A good day for Martin and an even better day for the whole Yamalube Star Racing Yamaha team, which owned all three spots on the podium with Alex and Jeremy Martin, and Webb. We know what you’re thinking. 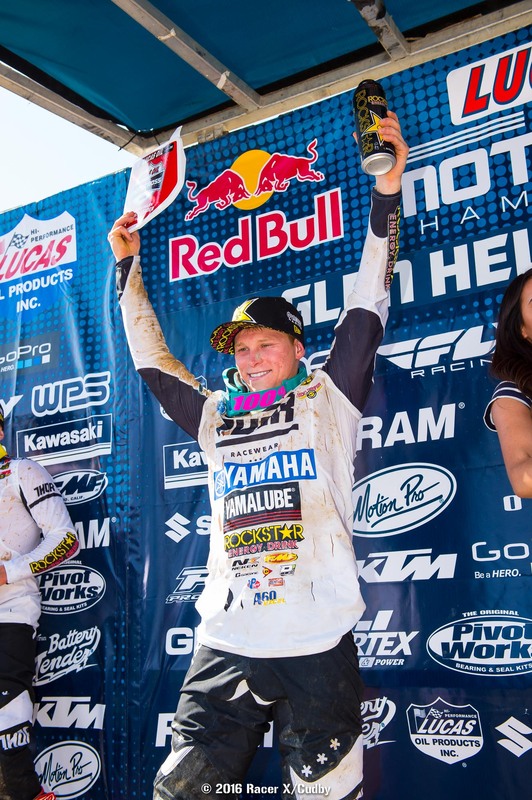 How did Martin gain the points lead when Savatgy came into Glen Helen fifteen points up? Well, Savatgy simply didn’t have a good day. The Monster Energy Pro Circuit Kawasaki rider got bad starts, especially in the first moto, and just wasn’t able to move up quickly. He ended up going 9-7 for seventh overall. Definitely a bummer for Savatgy, but he’s got ten rounds left to get the red plate back. Austin Forkner came close to ending up on the podium in just his second career national. He took third in the first moto and had second on lock before making a mistake at the top of a hill that ended with him dropping a few spots. Had he held onto second he would have taken second overall and Jeremy Martin would have won the overall. 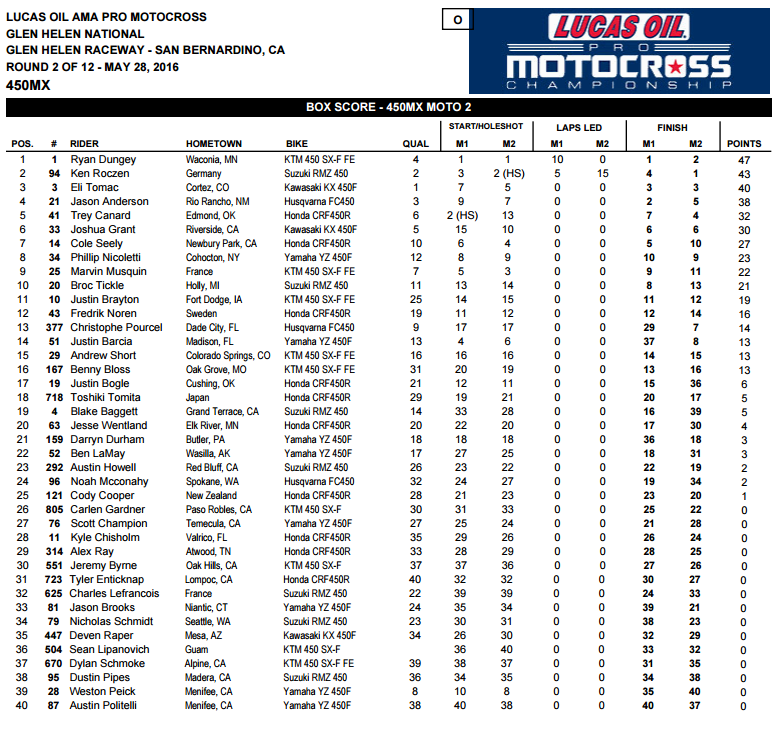 Instead Forkner wound up in fourth and J Mart was second. Still, fourth is excellent, and how cool is it two brothers went one and two for the day? Elsewhere, in news that isn’t cool, Christian Craig broke his leg today. He and Jordon Smith got together in the first moto and Craig went down hard, breaking his tibia and fibula in the process. It’s unfortunate for Craig, and GEICO Honda team manager Mike LaRocco was visibly bummed about it after the races. We knew the racing had the potential to get crazy today, and the first 450 moto delivered. Trey Canard got the holeshot but after a few turns Ryan Dungey moved into the lead as the two rocketed up one of Glen Helen’s big hills. Dungey started pulling a gap, and it looked like the crowd could be in for a boring moto. 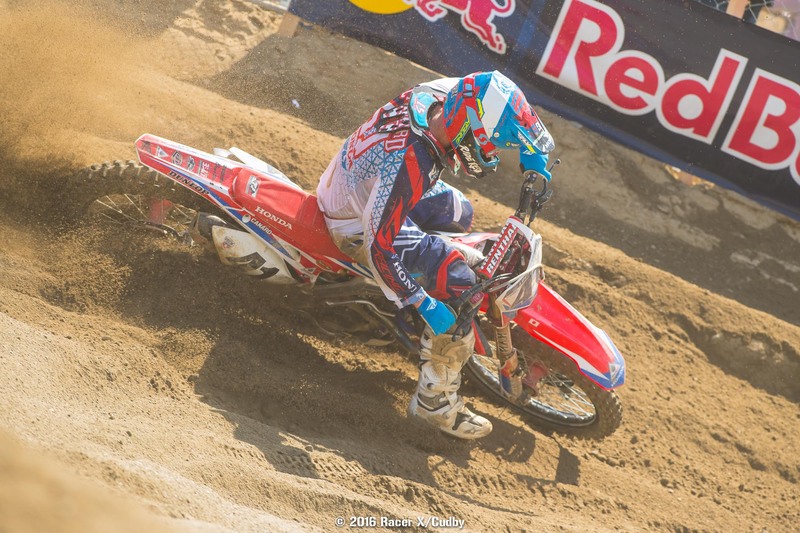 But Ken Roczen was able to get into second rather quickly and started reeling Dungey in. Just when it seemed there would be a major battle between the two Roczen made a mistake in a rhythm section, allowing Dungey to sprint back out. Roczen reloaded, caught him again, and made the pass. He then put down some ridiculously fast lap times, immediately gapping Dungey. At one point the gap was up to thirteen seconds! The race was all but over, but then something happened to Roczen. The word is something went wrong with Roczen’s forks. He refused to jump anything sizable out there, instead scrubbing everything. Dungey caught back up with two laps remaining, made the pass, and disappeared with the win. Jason Anderson, who’d reeled in Eli Tomac for third, also caught Roczen. Tomac followed suit on the final lap. Elsewhere Blake Baggett, who broke his collarbone last week, rode to sixteenth place from nearly dead last, even battling briefly with Justin Bogle for fifteenth. Not a good moto for the JGR crew. 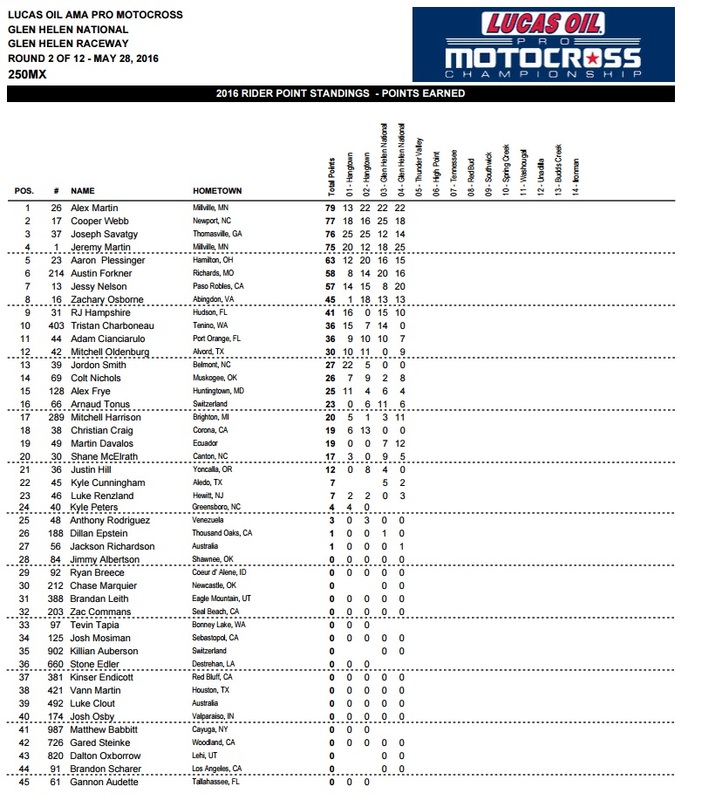 Phil Nicoletti did well, placing tenth, but both Justin Barcia and Weston Peick DNF’d after running well within the top ten. Peick crashed out, and we’ll update you on Barcia when we find out what happened. After a heartbreaking loss due to a mechanical problem in the first moto, Ken Roczen would not be denied in the second. He got a good start and ripped into the lead and started sprinting away. Dungey tried to follow, moving into second right away and giving chase, but Roczen wasn’t having it. Dungey was able to keep him within five seconds for a while, but as the moto wore on the gap just got bigger and bigger, eventually growing to about fifteen seconds. Dungey rode to a lonely second. There was quite a bit of action in third place though. Trey Canard held the position for a while before coming under fire from Jason Anderson, who finally took over the spot. But then Anderson swapped hard on a small uphill jump, nearly rocketing into Canard. Anderson went back to fourth, and his pace seemed to slow slightly after that. At this point Eli Tomac had worked his way up to fifth after an absolutely terrible start and started reeling in Anderson, just like Anderson had done to Tomac in the first moto. After getting by Anderson, Tomac caught Canard and the two put on a tremendous battle. Tomac was finally able to make the pass, but Canard fought back and regained third. Tomac retaliated immediately, scrubbing a jump and passing Canard in the next turn and sprinting away. That’s as far as he would get though, as about twenty seconds separated him from Dungey. Roczen won the moto but Dungey took the overall. Jeremy Martin got out to the early lead in this one and immediately started sprinting away from Jessy Nelson in second. It looked like Martin was going to try to disappear, but Austin Forkner got around Nelson before that happened and started matching the champ’s pace, even turning a few faster laps here and there. He managed to get the gap down to below two seconds but a mistake at the top of a hill knocked him down to sixth. Had he held onto second he would have taken second overall in just his second career National. 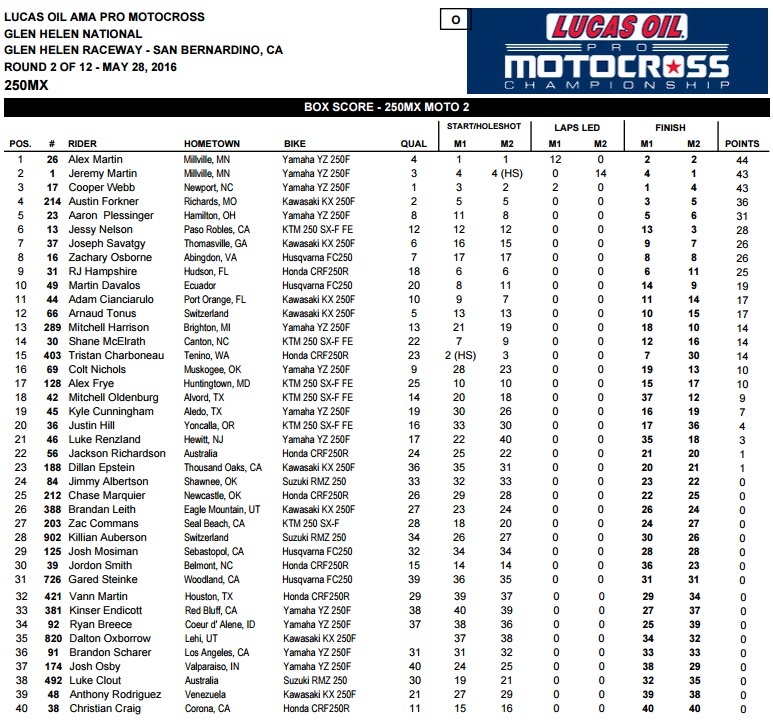 Forkner’s error handed second back to Nelson and third to Alex Martin, although Webb, who’d hunted down A. Martin in the first moto for the win, was running fourth. If he could catch A. Martin again he’d win the overall. But A. Martin was flying and even caught Nelson with about two minutes to go, putting himself in position to win the overall. Webb wasn’t out of contention, however, and started closing in on Nelson. But then Nelson turned the speed back on and maintained the gap, allowing A. Martin to win his first ever National. And if that wasn’t enough, he’ll also be sporting the red plate next weekend, as Savatgy's 9-7 hands the points lead to A. Martin. 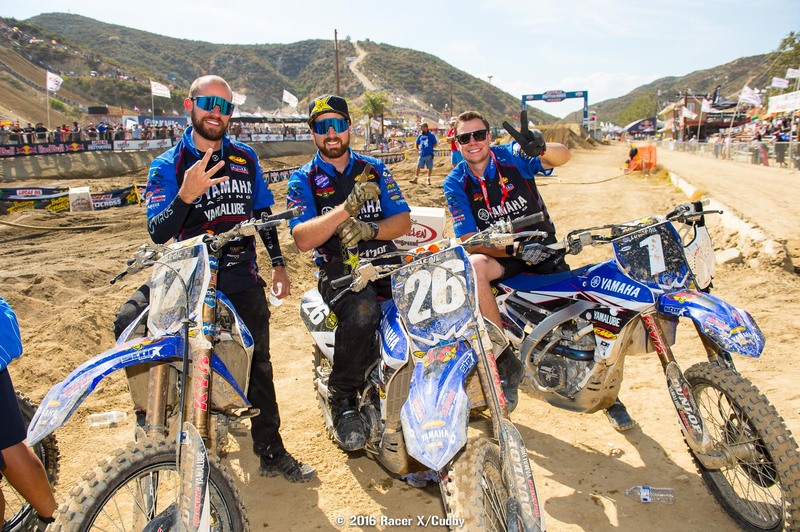 Great day for Yamalube Star Racing Yamaha—the team completely owned the podium. 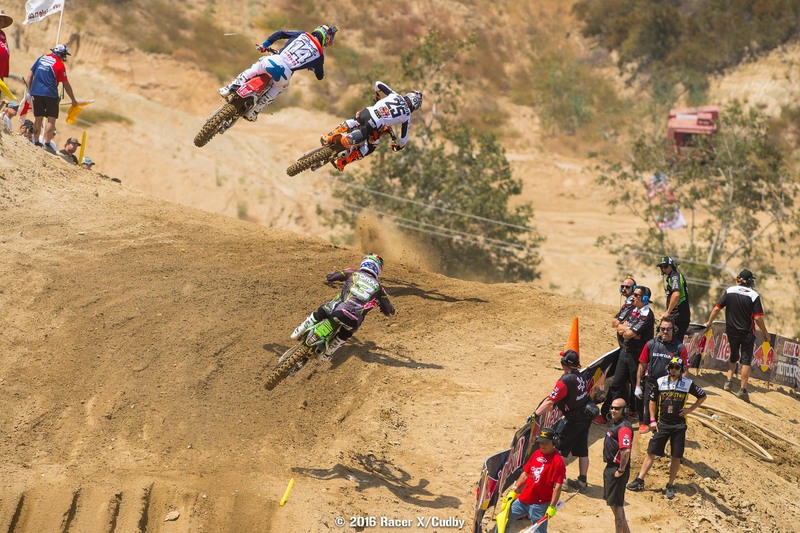 Today’s track is everything you’d expect from Glen Helen. Huge, steep hills, and dirt that’s going to get rough in a hurry. There are some big jumps too, and we can’t forget about Talladega Turn, one of the coolest and most unique first turns in all of motocross. From pictures it’s hard to tell just how steep and banked it is, but just imagine lining up behind the gate and staring at a wall in the distance. It’s kind of like that. Today promises to be much hotter than last week, although at a projected high of 85 degrees, it's nowhere near what we've seen in the past here. If you’re participating in any fantasy leagues and need a refresher on who’s racing, Blake Baggett is in today after breaking his collarbone during the second moto at Hangtown. He had surgery on Monday and was considering racing today, but decided to sit out after doctors advised against it. The plan was to return at High Point, but early this morning news broke that Baggett had indeed decided to give practice a try and see how his collarbone holds up. His teammate, James Stewart, crashed last week and popped his shoulder out. He’ll go out for practice to see how it feels and will make a decision on whether or not he’ll race after that. Jeremy Martin and Joey Savatgy took turns holding the fastest times in the final practice session, but when the checkers came out neither one of them were on top. 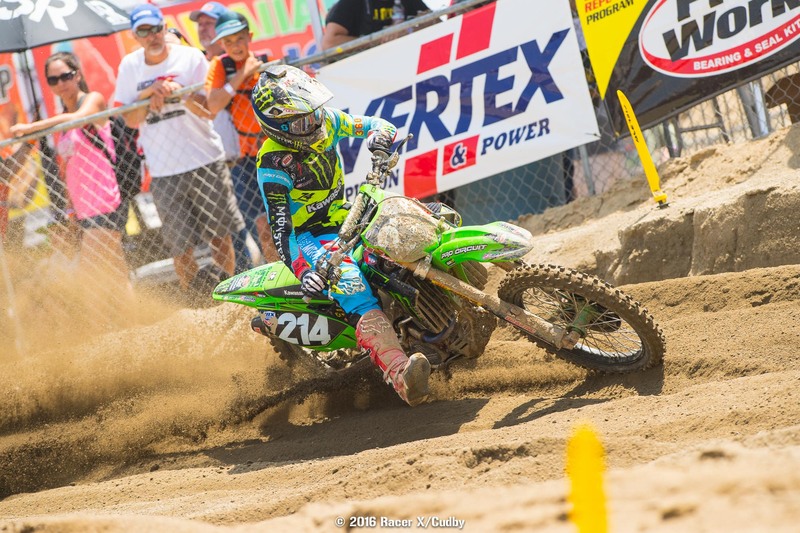 Instead it was rookie Austin Forkner, who topped the field by about two tenths. 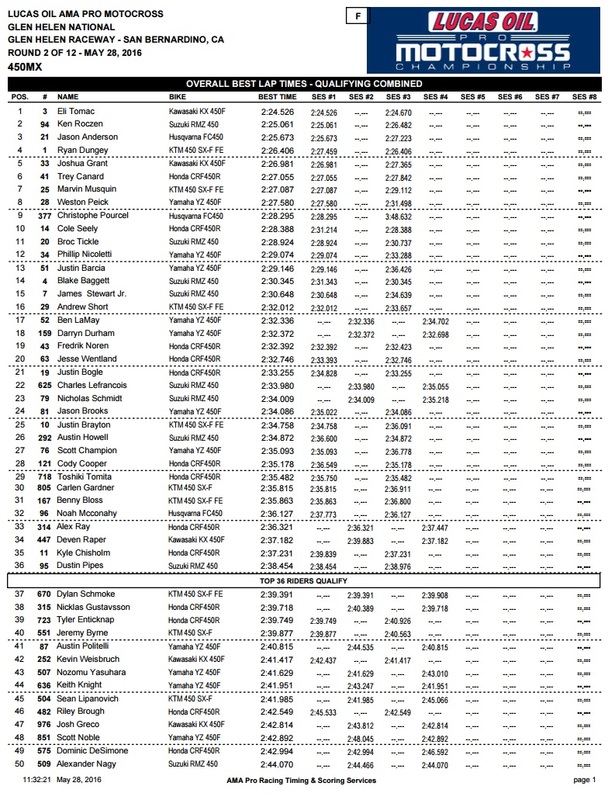 The track was a little slower in this session so his fastest time won’t hold up in the combined results, but even there he was only a tenth behind fastest qualifier Cooper Webb. We’ll see if he can produce that kind of speed this afternoon for both motos. Joey Savatgy was good in the second session too, actually beating his time from the first on a track that was definitely rougher. If the times from this practice are any indication of what the racing will be like we're in for a good day—the top five were separated by less than half a second! The track must have changed a lot for the final 450 session because there was a pretty steady stream of riders pulling into the mechanic’s area for bike adjustments. Justin Brayton, Ryan Dungey, Trey Canard, Christophe Pourcel, Josh Grant, Ken Roczen, Andrew Short, James Stewart, Weston Peick, Justin Bogle, and more all pulled in for changes, some of them more than once. Even Eli Tomac pulled in for adjustments right after setting one of his fastest laps of the session! 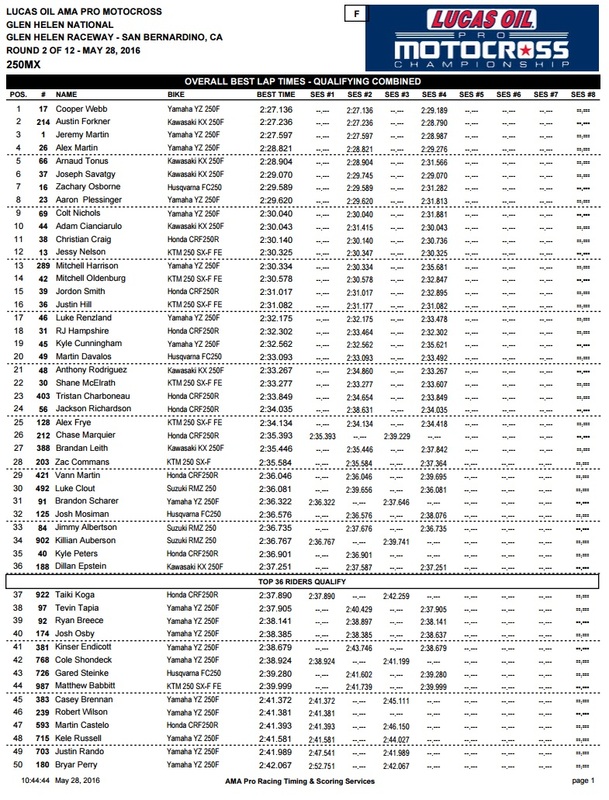 And speaking of Tomac, he set the fastest time yet again, almost two seconds ahead of Ryan Dungey. But the good news for Dungey is he was much better in the final practice, moving up to second fastest from seventh fastest. He was also faster in the second session than the first, while most everyone else was slower. Don’t forget to check back here for updates throughout today’s motos. The action promises to be superb, and today’s track is a masterpiece. Watching riders scrub some of the steep downhill jumps is breathtaking and there is a massive jump in a far corner that’s giving riders more hang time than a picture frame. The track is also getting rough, and bikes are bouncing around like crazy in a few areas. Watching the best riders in the world race each other on this surface is going to be spectacular. 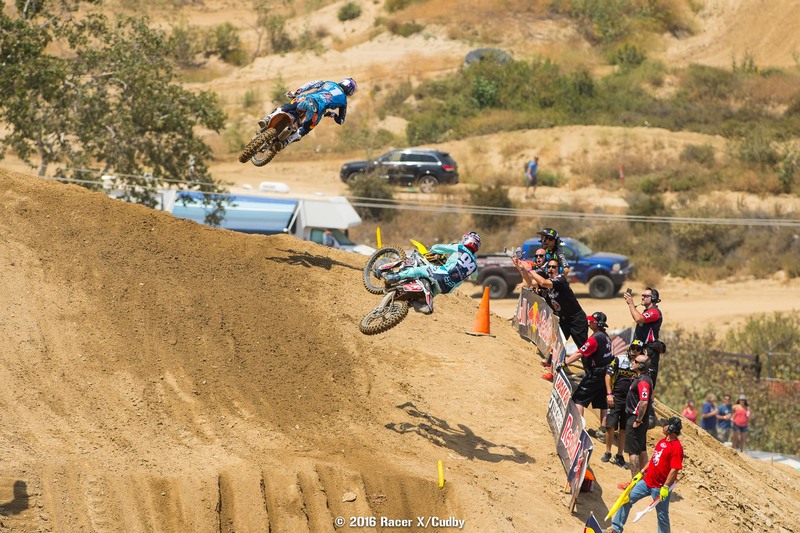 Yoshimura Suzuki riders James Stewart and Blake Baggett both came into the FMF Glen Helen National injured. Baggett broke his collarbone last week and Stewart popped his shoulder out of joint in a crash at Hangtown. Surprisingly, both riders decided to ride practice today to see whether or not they'd be able to race. We just spoke with the team and the latest word is Stewart will sit out and Baggett will race. Stewart and Baggett qualified fifteenth and fourteenth, respectively.